The fathers themselves (Hellhammer) could hardly cope with so much stuff. Howsoever they have developed themselves. And we could not say that there is any development in the music of Warhammer, though some tracks are faster. In reference to the front cover and the sound from 1983-1984 things are under control. Many people think that the recording of cover songs shows somewhat exhausting of the band and a lack of ideas. But not this band! The three bonus tracks – cover songs in the end of the album present an incredible creative shock, set on by Warhammer. Poison, Venom and Bathory are modified in a manner as if it happens in 1983, and not because of influences. The reason is that Warhammer live with the music of these bands. For those who are not acquainted with Hellhammer I will say that heavy Black Sabbath’s riffs are combined with the aggression of Venom and the mystics of Angel Witch. 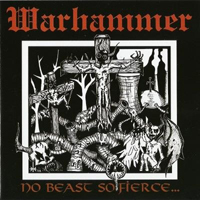 The album of Warhammer deserves careful listening. If you need an old school spirit to be encharged with, “No Beast So Fierce” is for you!